This is the second post about my visit at the toysfair. 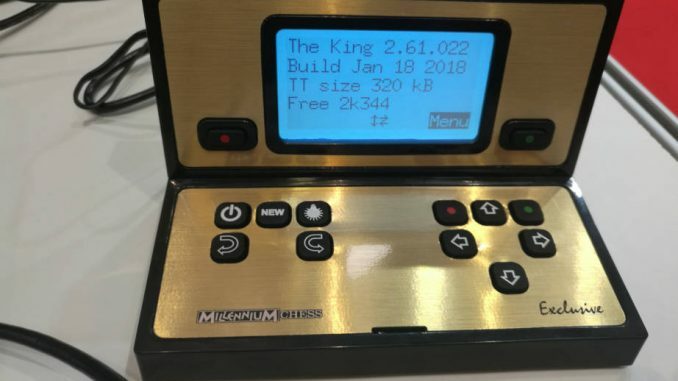 My next stop was to visit Millennium 2000 to see their new product “The king”. This module is expected to be on market mid of 2018. 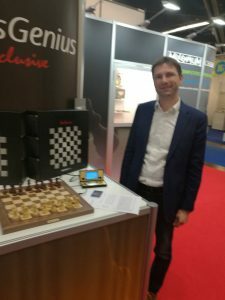 This company continue what they started with their product Chess Genius Exclusive to bring out another module. This “King” module running the famous king chess program made from Johan de Konig inside. The modul price is 199€. Also millennium listened to its customers and designed this module now in a wood case. You probably know “the king” cause its active dynamic style. The king likes to attack and this is what it made famous since Johan de Konig released it several years ago. 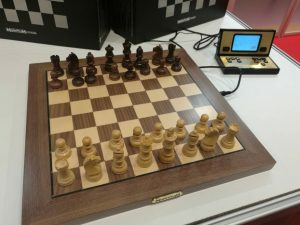 In the toyfair i was able to play a game against this chess engine and it was fun but the result was not in my favour 😉 So, i expect this module being in market sooner as the dgt chess computer. Anyway the target customers are different. Another product they showed was the C-Modul for a price of 99€. 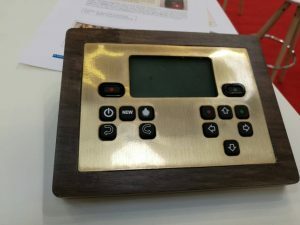 This connectivity module allows to use the millennium exclusive chess board together with any software implementing the open interface. And this is really great – so by theory it could be possible to link picochess together with these boards too. Lets see what the future brings. Millennium Chess Genius Exclusive with Picochess would be great! !